League 1 report: One hopes that the Posh players enjoyed their day off on Christmas Day with their families. It’s a fair bet they will be working pretty hard for the rest of the festive season. Make no mistake the first hour of this game was as bad as anything else in a pitiful run of four points from the last nine League One matches. Chesterfield were unlucky to be only 3-0 ahead in that time such was their dominance and the fact that Posh somehow scored twice in the final half hour before accepting a 12th (out of 13) one-goal defeat of the season shouldn’t be allowed to paper over some pretty gaping cracks. Posh boss Darren Ferguson said as much himself before acknowledging that his players are struggling with the demands of the midfield diamond. This is true, but they are also finding the basic defensive principles of tackling and marking beyond them, while creativity and passing to each other on a regular basis is a concept they currently find more puzzling than rocket science. Not until first-half substitute Marcus Maddison intervened did Posh threaten a decent shot at goal, never mind a comeback. Maddison had a hand in two second-half goals that arrived 10 minutes apart and, rather incredibly given the one-sided nature of most of the contest, Posh even missed a glorious chance to equalise when Harry Beautyman raced clear in added time only to see home ‘keeper Tommy Lee thwart what would have been the most unlikely and most undeserved comeback of the season. Posh had 20 minutes to fashion an equaliser against a team that were becoming increasingly nervous and yet that one last-gasp opportunity was the only time they threatened. It was a dreadful spectacle for the visiting support, some of whom were happy to taunt their team’s manager as well as get behind the players. Ferguson must be fearing a Christmas sack. Posh chairman Darragh MacAnthony is an optimistic fellow, but the closeness of the final scoreline won’t fool him. It’s presumably a great view from the directors’ box, certainly good enough to witness a feeble performance from a team apparently blessed with enormous potential, yet blatantly lacking in passion, confidence and organisation. Sunday’s (December 28) clash with Doncaster at The ABAX Stadium could be a huge game for the manager. It’s the last one for 13 days for a start - time aplenty, according to Ferguson’s critics at least, for a new boss to get to grips with the job, Ferguson must find a way to get Maddison into the starting line-up alongside Erhun Oztumer which would presumably mean a different midfield formation. It was a surprise here that the dreaded diamond lasted 45 minutes as Chesterfield attacked down the flanks with enromous success and delivered a stream of crosses, all of which threatened a goal from the fifth minute onwards when Gary Roberts forced Posh ‘keeper Ben Alwnick to save with his legs with a far post volley. Roberts tormented Michael Bostwick, while home right-back Tandayi Darikwa revelled in so much space it was inevitable he would be involved in the opening goal in the 11th minute, easing past Joe Newell before a right-wing cross was diverted home, unfortunately by Posh centre-back Gaby Zakuani, although Eoin Doyle was understandably keen to celebrate his 20th goal of a terrific season by claiming a decisive touch. Posh’s current formation relies on a passing accuracy that none of the midfielders possess. Oztumer does best, but once Jack Payne went off complaining about dizziness and nausea, Posh should immediately have switched to 4-4-2. Instead Posh stuck Newell, for whom tackling, blocking and marking are not strengths, at the base of the diamond and Chesterfield promptly added a second goal when a slow, low left-wing cross proved too hot for the Posh back four to handle enabling Armand Granduillet to score easily from eight yards. Gary Roberts missed the first of his two sitters before the break, but when Doyle slammed home the third goal 10 minutes after the re-start from 25 yards as the Posh defence retreated a Boxing Day rout looked on the cards. But a weird final 30 minutes instead took place. 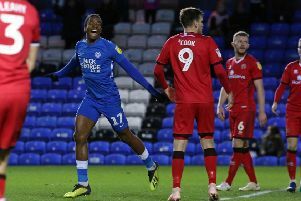 Posh still enjoyed little possession and yet scored twice in two attacks 10 minutes apart, first when Michael Bostwick headed home Maddison’s free-kick and then when Maddison’s lovely cross found it’s way into the net as a darting run from recalled striker Luke James put Lee off. It was surely safe then to expect a seige from the team with momentum? Not at all. Posh chipped free-kicks into Lee’s hands, crossed the ball out of play and continued to give the ball away in midfield. Roberts and Romuald Boco both missed great opportunities to make the game safe. How many chances Ferguson gets to make his own job safe is for MacAnthony to know and the rest of us to guess. Posh: Ben Alnwick, Michael Bostwick, Michael Smith (sub Nathaniel Mendez-Laing, 72 mins), Gaby Zakuani, Christian Burgess, Jack Payne (sub Marcus Maddison, 28 mins), Harry Beautyman, Joe Newell, Erhun Oztumer, Aaron Mclean (sub Conor Washington, 61 mins), Luke James. Unused substitutes: Joe Day, Ricardo Santos, Kyle Vassell, Jermaine Anderson. Chesterfield: Tommy Lee, Tendayi Darikwa, Sam Hird, Ritchie Humphrey, Ian Evatt, Sam Clucas, Charlie Raglan, Gary Roberts (sub Ollie Banks, 72 mins), Romuald Boco (sub Jay O’Shea, 72 mins), Armand Gnanduillet (sub Dan Jones, 60 mins), Eoin Doyle. Unused substitutes: Myles Wright, Dan Gardner, Gboly Ariyibi, Billy Beresford. Chesterfield - Zakuani (og, 11 mins), Doyle (55 mins), Gnanduillet (33 mins). Cautions: Posh - Burgess (dissent), Mendez-Laing (foul). Chesterfield - Raglan (foul), Humphreys (foul), Banks (foul), Doyle (unsportsmanlike conduct).